tracking : ..the cat came back..
Last night I tried a little experiment on my jailbroken iPhone. Since I’d already started poking about playing with my own Winterboard themes and have been tracking my iPhone’s location for a while now, I thought I’d see what happened if I mixed the two. So, how about wallpaper that followed you? It turns out that combining the two is relatively straight forward. Google now provide a mechanism for getting what they call static maps which will allow you to get an image centered on a set of coordinates. You can also add your own markers if you want. There are some limitations on the number and size of the maps that you can retrieve so I employed a very simple caching mechanism to ensure I didn’t annoy Google. This certainly helps speed things up when testing and also enabled me to identify a small issue I was having. Remember when I mentioned my tracking application for the TomTom Go? Well last night I found a little bit of spare time so I could port it to the Neo 1973. I say ‘port’, it wasn’t so much a port as a ripping out of the TomTom specific stuff and adding a little GTK interface. It’s not massively impressive to look at but it is actually my first GTK application. There is quite a bit of hard coded stuff in there at the moment but I do intend to move this to a config file. Currently, if the distance between the previous and current positions is below a certain threshold, a packet is not transmitted at all and position checks only occur at 15 second intervals. The data that is sent out is encrypted with a very simple algorithm, but I’m more interested in low cpu usage and speed at this point. I’m also going to be fairly honest about the state of the code at the moment, it’s not a pretty sight at all. 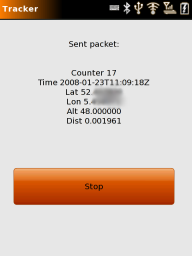 I need to put together something on the server side to decode the packets, I know I have it somewhere, it’s just a matter of locating it. I did wonder if the application should have an interface at all or if it should just run in the background, ‘secretly’ so that if someone stole your Neo you might actually be able to trace it. The one thing that this did show me, however, is that you can’t actually run gllin for a particularly long time. I think it’s a minor fix but it does tend to fill up the free space on the Neo with its log data. I guess just disabling this might help, though I haven’t actually bothered to poke around with that just yet. The other news is that to build this application I used the new toolchain and I have to say it makes life a whole lot easier. As a result I will also be building the toolchain at regular intervals and providing downloads via my buildhost. Sorry, but I can only build 32 bit versions at this time. Some time ago I wrote what I called the “Ramius” edition of my tracker application for the TomTom Go. The limitations of the Go SDK caused more than its fair share of grief and I shelved the project, hoping to revive it later. Now I’m thinking that it’s time to bring it back to life. At the moment I’m selling my house in The Netherlands and moving back to the UK. Until the house sells I flit between the UK and Holland every couple of weeks. I’ve taken to using the Chunnel for this because it means I can drive through the night rather than have to bend to the ferry or flight schedules. The trouble is, my wife gets worried that I’m going to crash and burn. She does this every time I do the trip, in either direction. She wont go to bed until she knows that I’ve at least got to the Tunnel. I brought the original code out of my archive and started looking at it, removing anything that was TomTom specific. I’m pretty sure that I’ll have a workable solution fairly soon, I may butcher the openmoko-agpsui2 application a bit too, just to add a face to the tracker application code. Obviously, it will need a network connection of some sort so I’ll be looking at starting and stopping a gprs connection, or using wifi when the GTA02 arrives. On the topic of gprs and network connections, I was mulling over some points in my mind about this. Nobody wants their Neo to pull an iPhone, and give us all large bills because of roaming, so there needs to be some mechanism where the user can deny or allow access to things like gprs connections. These could be based on dates, times, even locations with the built in gps. The problem is not that it is difficult to do, the problem is that we need to be able to force applications to use an API to open gprs and wifi conections, and possibly even access the gps. There’s a whole kettle of fish here. Openmoko is opensource, not the Google kind of ‘opensouce’, the real kind. That in itself poses a few questions and perhaps some not so nice answers. If we want to force people to use an API, then we have to make sure that they can only use the API and not bypass it. If they can bypass it, it’s useless because the malicious ‘l33t h4x0r’ is going to abuse your connection. The problem is, since we are opensource, the same abuser can simply replace the API. Sure you still have to install the application, but just think about it. Right now how many places do you update your Neo from with ipkg? If any one of those gets compromised or the owner deliberately alters packages, the first you’ll know of it is when you bill hits the mat with a thud rather than the usual ‘ftht’. We can think about signed images or signed packages etc but that is not really going to help, this is opensource. As an application developer I’m going to want to publish applications, I don’t really want to have to get them certified or signed by someone else just so other people can use them. If you alert the user that an application or package is not signed, you know that they’ll just click ‘ok install it anyway’ and ignore it. I think I’m going to have to ponder this one a little longer.